New methods are evolving all the time, which move us closer to the goal of individualized treatment. One such method, BIORESONANCE, also known as BRT, practised mostly in Germany for 15 years, can be used to treat a wide range of disorders. Bio-resonance promises not only to address the unique needs of each patient, but also, as it becomes more widespread, to provide an answer to the nagging question: "Why do some individuals do well with one type of medication, while others improve only slightly or not at all?" 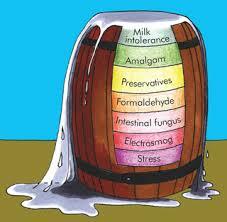 At the Da Vinci Center, we also use Bioresonance Therapy for FOOD INTOLERANCE DESENSITIZATION. Central to its application is the idea that all life is made of energy. Although humans tend to think of themselves as relatively solid creatures, we are actually just a mass of compressed energy. We emit our own electromagnetic fields and, as with all things, we each have our own unique "vibration", or oscillation. This oscillation can easily be measured with electronic equipment. When we are healthy, our bodies produce a smooth, regular oscillation. When the body is under stress, the pattern becomes jagged and irregular. The patient's body signals are conducted from the right hand into the input of the device using a BICOM electrode. In the BICOM device the disharmonious frequencies are filtered out and inverted. These inverted therapeutic oscillations are now given back to the patient via the left hand using another electrode. There has been a lot of recent media coverage on exposure to electromagnetic fields causing illness by altering the bodies own electric "chemistry". However, practitioners of bio-resonance believe that the reverse is also true; healthy electrical signals transmitted into the body, in this case via hand-held electrodes, can re-harmonize it. In common with homoeopathy and acupuncture, bio-resonance aims to relieve the body of stress factors and improve its regulatory systems. According to naturopath Reinhold Will, one of the most experienced practitioners of bio-resonance in the UK, "The patient's energy usually has two paths: the physiological and the pathological. The healthy, physiological part comes from those organs and tissues, which are in order, and we can use the oscillations of these to strengthen the body. The pathological part can come from either those organs or tissues, which are dysfunctional, or from substances, like allergens and toxins, which are stored in the body and emit their own oscillations. These pathological oscillations can disturb the healthy oscillations in the rest of the body and, in extreme cases, can become the dominant energy in the body." The treatment of pathological oscillations is to return them back to the body in a modified form- in this case, as a mirror image. This action is based on the principle, as well known in physics, that oscillations are influenced by their exact mirror image. Returning the oscillation to the patient in this modified form can diminish, or even eliminate, the pathological oscillations of the allergen or toxin, allowing the body's own healthy oscillations to become dominant. If the practitioner decides that medicine would also be useful in treatment, the oscillation of that specific medicine could also be returned to the patient. These returning oscillations help to balance the patient electromagnetically, and are again fed into the BICOM device for further analysis. The process is repeated constantly in fractions of a second. The pathological signals in the body are consequently reduced and finally extinguished, and the physiological endogenous regulatory forces can regulate the biological process unhindered. According to Mr. Will, the word "resonance" is the key to the therapy's clinical success. It also provides clues as to why some people simply don't respond to certain medicines- no matter how well proven they are. "When you want to give a person a treatment, this treatment must resonate with them. Just as every patient has specific oscillations, every remedy also has specific oscillations. For instance, there are several remedies which could be used for disorders of the lymph system, and certain persons, because of their oscillations, will react better to one or the other. We can find which remedy resonates with the patient best with the BICOM bio-resonance therapy device by testing the oscillations of the remedy before hand." Mr. Will cites an uncomplicated case of a 12-year old boy that experienced asthma attacks and skin rashes during swimming lessons. Testing revealed that the chlorinated water in the pool caused these. The boy was first given basic therapy using his own healthy oscillations - the aim of which was to strengthen his body for the next phase of treatment. Next, the oscillations from the pool water were returned to the boy in their inverted form. The boy was cured of his allergy and was able to rejoin his class. 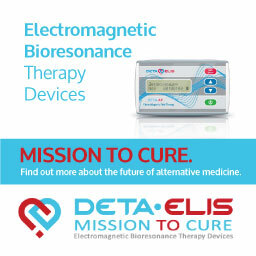 Although bio-resonance is ideally suited to paediatric use - since it does not involve the direct use of medicines - Mr. Will also reports remarkable success with adults with more complex problems, such us multiple chemical sensitivity and even cancer. With meticulous history taking, practitioners of bio-resonance can, he says, tackle any illness, although the system, like all others, does have its limits. 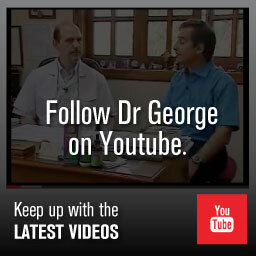 "Once something is gone, for instance cartilage which has degenerated, we can't bring it back. Also, in many cases changes in diet and lifestyle will be necessary and, for some, the therapy should be combined with other supportive therapies, such as homoeopathy, osteopathy, hydrotherapy or even psychotherapy." In Germany there are about 3,000 practitioners of bio-resonance. In the UK there are less than 100, with only 15 of these practicing at the advanced level of Mr. Will. Although as of yet unproven, it's a tantalizing form of therapy which integrates the best aspects of alternative medicine, with its emphasis on history taking, individual treatment, the principles of energy medicine and advanced technology. It's a therapy to keep your eye on, and according to Reinhold Will it is even more than that: "Is it the future of medicine? Yes, absolutely!" 1. 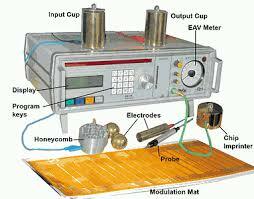 In and around the human body there are electromagnetic oscillations. These electromagnetic oscillations are superordinate to the biochemical processes and control them. Cell associations (symplasms) and organs oscillate in particular frequency ranges. An oscillation spectrum thus arises in the organism. 2. As well as the physiological electromagnetic oscillations, there are also pathological interfering oscillations in every person, caused for example by toxin loads, injuries, infections, incompletely cured diseases, iatrogenic damage. 3. The physiological and pathological oscillations together are referred to as the patient's own oscillations. 4. The patient's own oscillations can be picked up from the surface of the body (antenna effect) and conducted through a lead into a therapy device. 5. 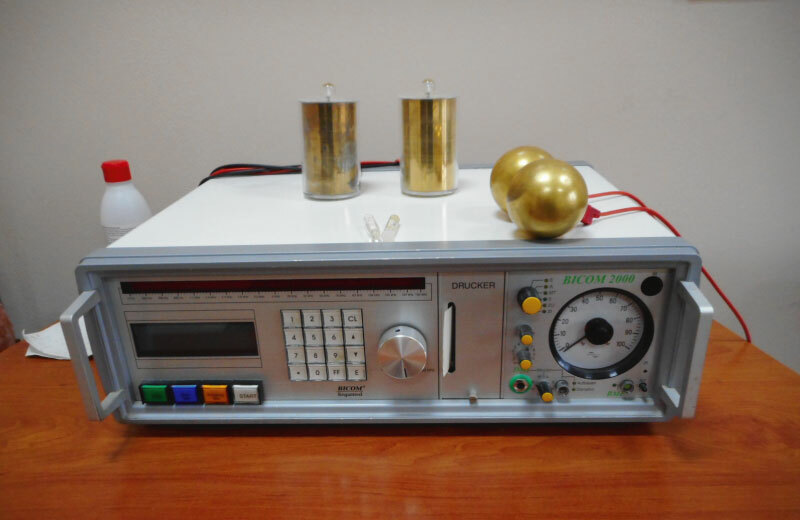 Therapy oscillations are made from the patient's own oscillations with the aid of modern electronics (BICOM device), without adding other or technically generated frequencies. 6. 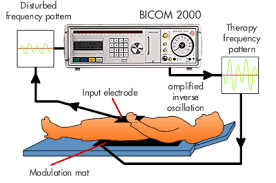 The patient's own oscillations transformed into therapy oscillations are fed back from the BICOM device to the patient's body. The therapeutic effect does not take place in the therapy device but in the body of the patient himself. 7. The therapy oscillations cause a therapeutic effect in the patient's body firstly by suppressing or reducing the pathological oscillations and secondly by exciting or strengthening the physiological oscillations. 8. The aim of bioresonance therapy is to reduce or eliminate the pathological oscillations and at the same time strengthen the physiological oscillations. 9. Improvements at the biophysical energy level are followed in time by an improvement in the biochemical processes in the direction of normalisation or healing. 10. The principal aim of bioresonance therapy is to activate the endogenous regulatory forces and free them of the interfering, pathological influences to the extent necessary for a return to health. 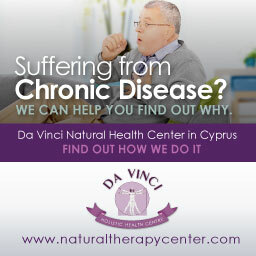 At the DaVinci Natural Health Centre it is possible to undergo careful diagnosis using the VEGA vegetative testing unit to determine the specific allergens, and even the specific body tissues and organs that have pathological oscillations. Based on these diagnostic findings the BICOM bio-resonance device can be used to balance these pathological oscillations, and enhance the healthy ones. The bio-resonance therapy device is excellent for the treatment of a wide array of allergies, including food intolerances with spectacular results, as well as many other disease processes. Dr Georgiou has been a bioresonace practitioner for more than 20 years having used mosty the VEGA and BICOM technologies, but has experimented with many others. 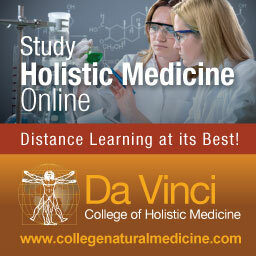 He holds a Diploma in Electronic Impulse Therapy, is a naturopath and has a Doctor of Science in Alternative Medicine. BRT has been tested and approved throughout Europe and Canada, and it is in use in 85 countries worldwide. In Germany, where it was developed by Regumed, BRT has been in use for over 25 years. 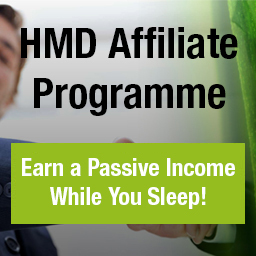 The following scientific studies have provided objective proof of its effectiveness, and hundreds of thousands of patients have been helped for more than two decades. Summary: From May to December of 2003, the Asthma Research Center of Jinan Children’s Hospital introduced the German manufactured BICOM® 2000 to treat 415 children suffering from asthma, 300 of whom were treated with the desensitization method. 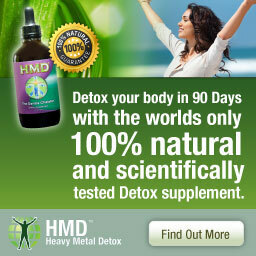 The total effectiveness rate reaches as high as 93.3%. Summary: Two independent double-blind studies, performed in Austria and Italy, demonstrated that bioinformation can be scanned and transferred by a bioresonance instrument (BICOM®). The metamorphosis of tadpoles could be greatly slowed down by transferring information from a toxic solution of the hormone thyroxin to the aquarium water in a number of parallel trials. Title: Noteworthy Therapy Results in Chronic Inflammatory Bowel Diseases with the Aid of BICOM® Bioresonance – Are ulcerative colitis and Morbus Crohn (Ileitis terminalis) really incurable diseases? Summary: The etiopathogenesis of chronic inflammatory bowel diseases, which are increasing in frequency similar to diseases with displaced symptoms, is, according to medical science, unclear to this day. But their latest investigations allow the supposition of a multi-factorial genetic disposition. A causal relation between dietary factors and the possibility of curing these bowel diseases is so far being considered as scientifically unproved. Morbus Crohn and ulcerative colitis are currently classified as chronic, incurable diseases, which patients have to contend with for their entire lives. Summary: The aim of the present trial was to check, using a defined clinical picture, whether measurable changes in biochemical parameters could be induced by bioresonance treatment. A group of patients with chronic liver disease was selected for this purpose and the target criterion was a reduction in the activity of enzymatic indicators of liver damage (GOT, GPT, gamma-GT) in the blood of treated patients as compared with a non-treated control group. Summary: The results show that the total effectiveness rate of this device in desensitization treatment reaches as high as 89% and total recovery rate is 78%. This study was conducted by Yuan Ze, Huang Jiali, Wang Haiyan and Yu Chunyan (Department of Pediatrics of Xi’an Central Hospital, Xi’an).